You can perform a variety of additional tasks with readers, writers, and their associated feature types. Reorder: In the Navigator window, re-ordering the position of readers and writers changes the order in which Workbench processes them. Disable/Enable: Removes a reader, writer, or feature type from the workspace without actually deleting it. Disabled objects can be re-enabled. In the workspace, disabled objects turn gray. Removeor Delete: Deletes a reader, writer or feature type from the workspace. Open Containing Folder: Allows you to view files of datasets, feature types, and linked custom transformers in the Transformer Gallery. To perform these tasks, Workbench provides a variety of tools to choose from. The options that are available depend on the tool, the object (reader, writer, or feature type), and the current position of the object in the workflow. When you click on a reader or writer feature type on the canvas, a mini toolbar appears. Enable or disable the feature type. 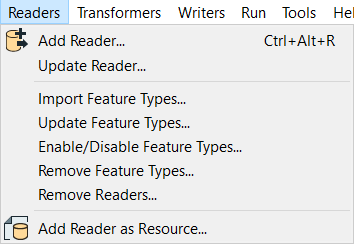 Enable or disable the reader or writer for the feature type (and all associated feature types). 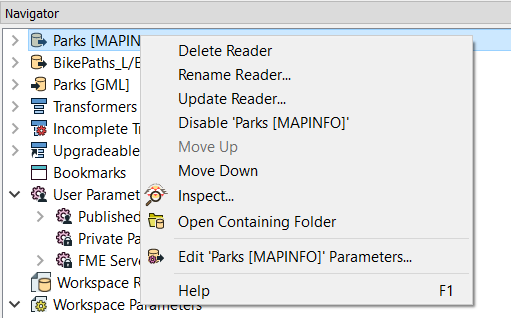 Edit parameters of the reader or writer for the feature type. Open the containing folder for the feature type.